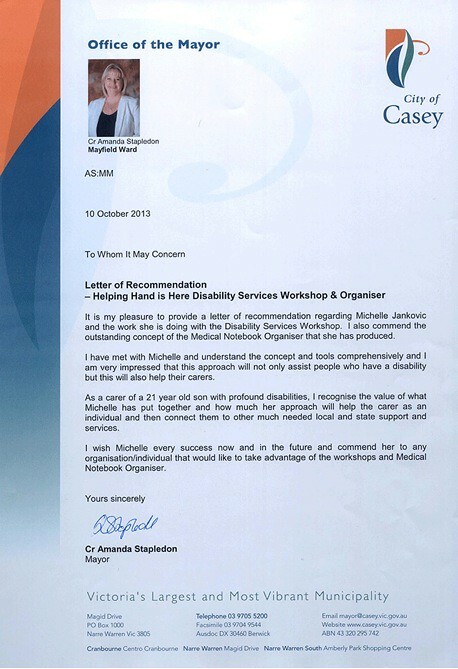 It is my pleasure to provide a letter of recommendation regarding Michelle Jankovic and the work she is doing with the Disability Services Workshop. I also commend the outstanding concept of the Medical Notebook Organiser that she has produced. I have met with Michelle and understand the concept and tools comprehensively and I am very impressed that this approach will not only assist people who have a disability but this will also help their carers. As a carer of a 21 year old son with profound disabilities, I recognise the value of what Michelle has put together and how much her approach will help the carer as an individual and then connect them to other much needed local and state support and services. I wish Michelle every success now and in the future and commend her to any organisation/individual that would like to take advantage of the workshops and Medical Notebook Organiser.